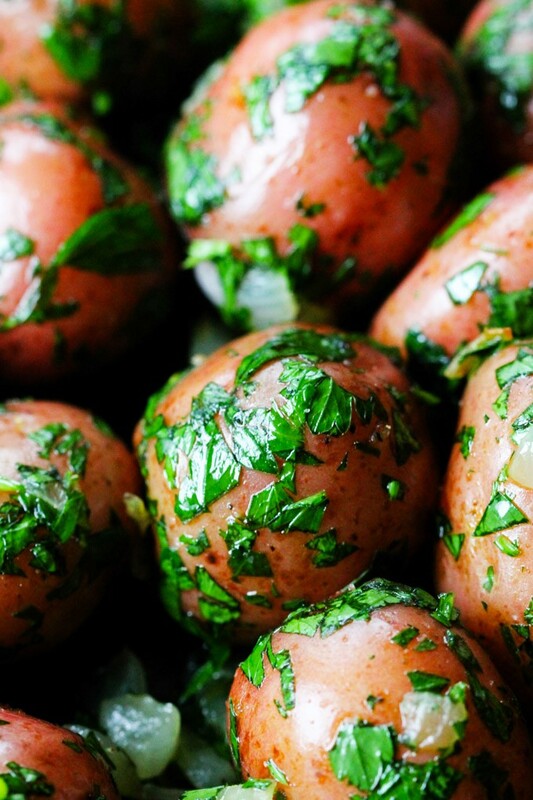 Parsley Potatoes are very easy to make. They are very fragrant and filling, yet you only need 4 ingredients to make them! It’s a perfect side dish for any meat or fish. It can also be eaten on its own or in the morning with a fried egg! 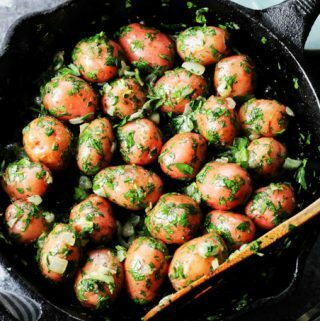 Imagine the beautiful egg yolk running down these super delicious potatoes…. 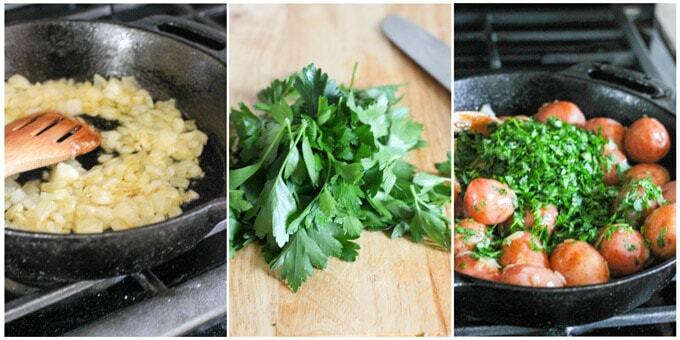 When I was growing up we would eat any type of potato with dill, but never with parsley. My mom would sprinkle some parsley on our soups or sauces, but never on potatoes. One of my friends who’s Hungarian, and pretty good cook, asked me if I’d ever made Parsley Potatoes. I said no and asked her how she makes them. Apparently, they’re very popular in Hungary. She mentioned that she was eating them all the time growing up in Hungary. And therein lies the difference between our countries of origin – we use different herbs for potatoes. 🙂 It seems like I’m on a real Hungarian streak now because frankly I haven’t been disappointed with anything I’ve tried. Have you seen my recipes for Hungarian Mushroom Soup and Hungarian Goulash? Oh, and lest I forget, I have one more queued up to roll out soon. 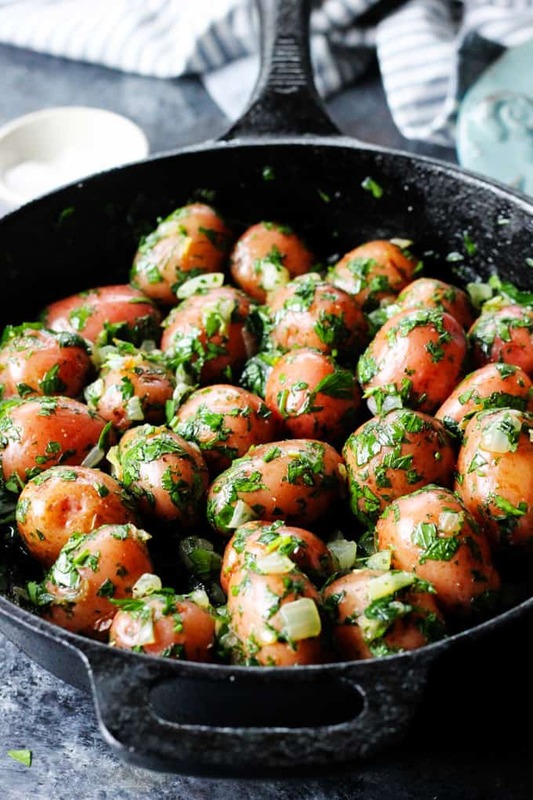 Anyhow, I was intrigued when my friend mentioned these potatoes because I really love parsley and when she told me that she also makes a lot of sauteed onions for them, I was sold. She uses large red or yellow potatoes that she peels and boils. 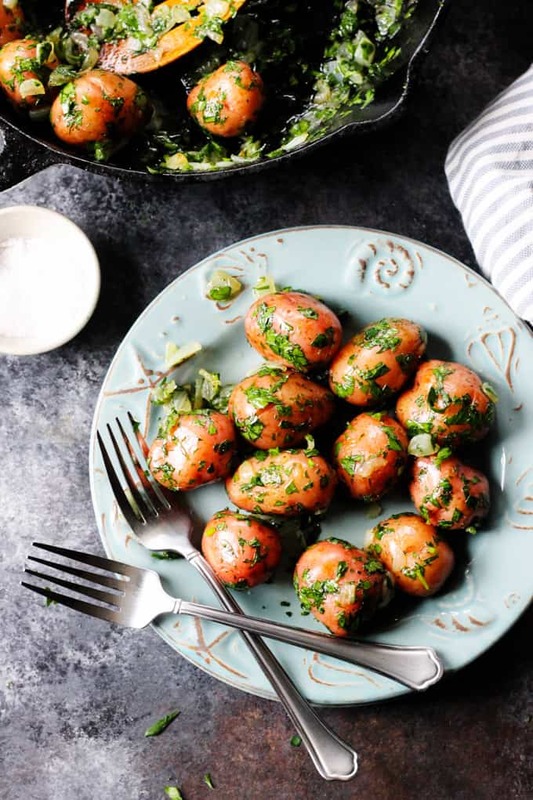 I decided to use small red potatoes for this recipe, because not only they are super cute but they’re also easy to handle (as you don’t have to peel them) and if the peel is organic, they’re even better for you. Don’t stress if you can’t find small red potatoes, use whichever one you have and when it comes to peeling….the choice is yours. They only need to be fork tender; then mixed with sautéed onions and parsley. Voila! Salt & Pepper, to season the dish. Exact measurements of the ingredients, as well as intsturcitions and nutritional information, can be found at the bottom of this post in a printable recipe card. Step 1: If you bought pre-washed potatoes, place them in a pot of water and bring to boil. If they’re not pre-washed, then scrub your potatoes to make sure that they’re clean. Once the water is boiling, add a generous amount of salt (1 to 1.5 tablespoons). Let the potatoes boil for about 30 minutes, until fork tender. Step 2: Chop your onions. Heat up olive oil in a skillet and then add your onions, sprinkle with some salt and pepper. Sauté the onions until soft, and set aside. Step 3: Wash and dry your parsley (you will need the whole bunch). Cut off the stems and chop the leaves. Step 4: Drain the potatoes, add them to the onions, and then add parsley. Combine and mix everything together, adjust seasoning with salt and pepper and serve. You will only need the following, and you probably have all of this at home anyway. In case you don’t here are some of my favorites. Colander (affiliate link) to drain the potatoes. 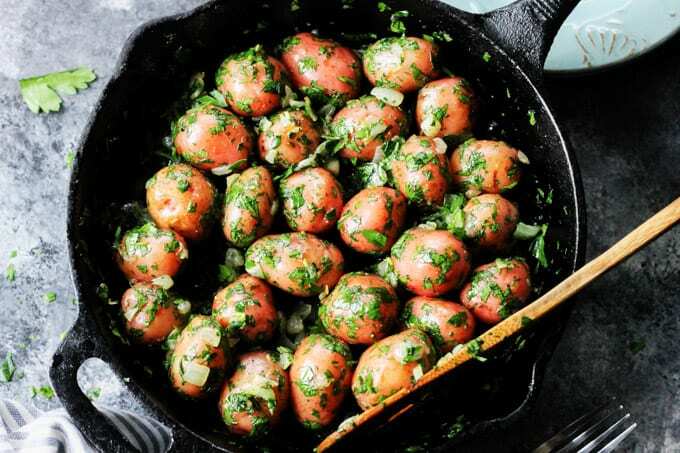 Parsley Potatoes are very easy to make. They are very fragrant and filling, yet you only need 4 ingredients to make them! It's a perfect side dish for any meat or fish. It can also be eaten on its own or in the morning with a fried egg! Imagine the beautiful egg yolk running down these super delicious potatoes. 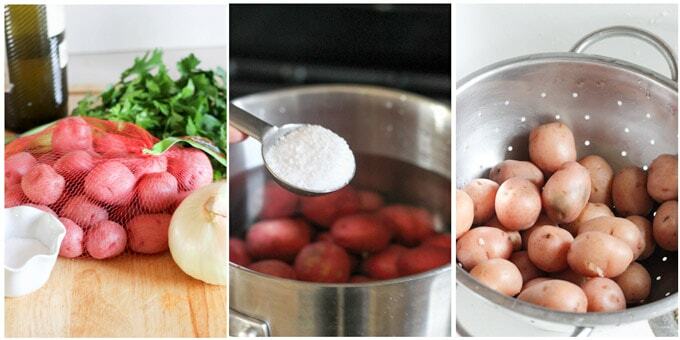 If you bought pre-washed potatoes, place them in a pot of water and bring to boil. If they're not pre-washed, then scrub your potatoes to make sure that they're clean. Once the water is boiling, add a generous amount of salt (1 to 1.5 tablespoons). Let the potatoes boil for about 30 minutes, until fork tender. Chop your onions. Heat up olive oil in a skillet and then add your onions, sprinkle with some salt and pepper. Sauté the onions until soft, and set aside. Wash and dry your parsley (you will need the whole bunch). Cut off the stems and chop the leaves. Drain the potatoes, add them to the onions, and then add parsley. Combine and mix everything together, adjust seasoning with salt and pepper and serve. This truly is the best potato recipe ive ever tried. bursting with flavor! baby potatoes are my favorite. I must try this the next time I cook potatoes. I love onions on anything and thats a great way to use up parsley. Usually, I’ll buy it for one recipe and end up not using up the rest. 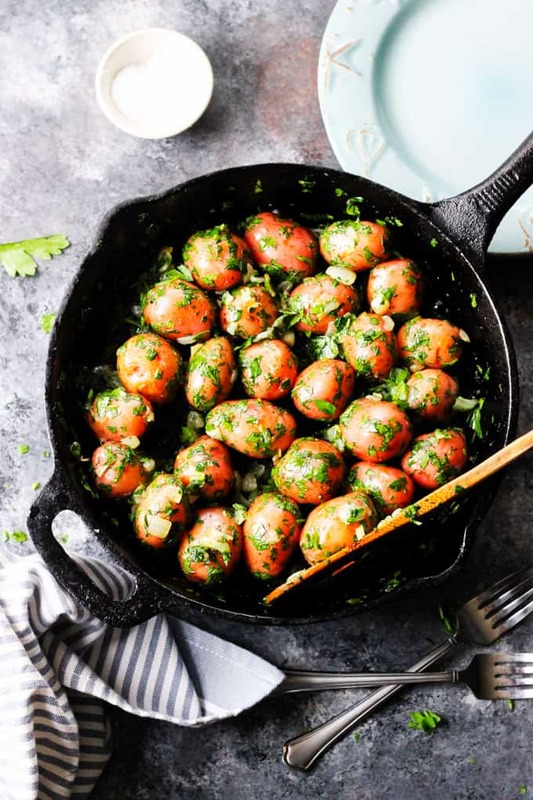 Really love that close up photo of the fresh parsley clinging to the potatoes. These look delicious. I love potatoes any way I can get them! I love your recipes and this isn’t an exception. I love everything about these potatoes. Looks absolutely delish. Thank you so much, Chichi!